Ghanaian artist Fatric Bewong has without doubt succeeded in employing items used in daily activities to convey complex narratives. 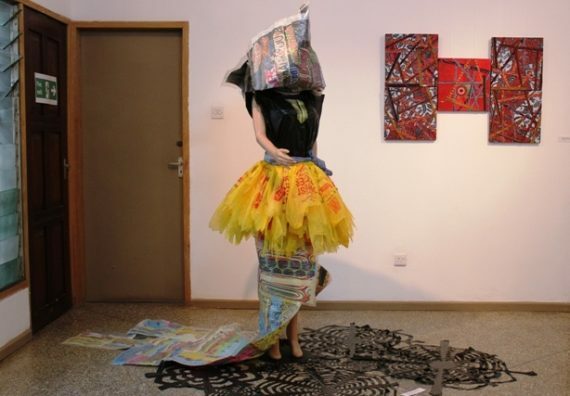 Her current exhibition, which is on-going at the Nubuke Foundation in Accra, comprise discarded pieces of fabrics and plastics that have been placed on boards, wrapped around tubes in concentric rings, attached to canvasses and installed on mannequins. She makes a successful foray into our management of the environment by handing over to us various discarded items that she has precariously thrown on (and around) a faceless mannequin thereby reminding us of the harm been perpetuated against the environment. 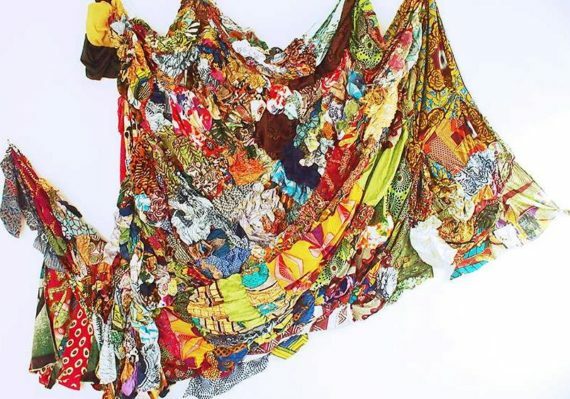 Loaded with artistic energy and expressive resonance, the works are characterized by obsessive quality and neatly interspersed with grid-like boards covered in colourful fabrics that are equally laden with social commentaries and memories. Rolled around long tubes, they appear like stalagmites and stalactites in ancient caves. Unquestionably, the artist who perceives the works as four-dimensional pieces suspended in time and space, mimics the chaos, contours and contortions of our environment. Undeniably, discarded plastic bags appear to have found a “home” on the streets, alleys drains and fields of the city instead of garbage bins and are often carried into the ocean by torrential rains thereby harming marine life – and the artist makes a bold attempt at reconstructing this scenario. Bewong is noted for highly abstract pieces that are characterized by little or no corporeal indication. Indeed, her new series of canvases, characterized by deliberate or incidental colour splish-splashes and splatters, embody an inspiring view on diverse issues. 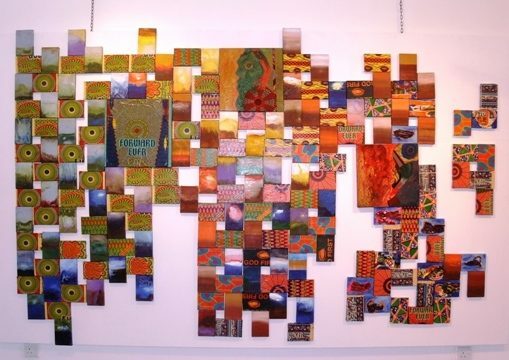 For the past several years, she has explored sounds and African proverbs, through paintings, installations and collage. 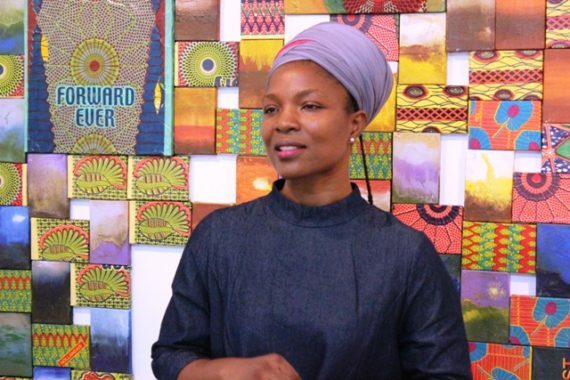 Bewong has equally accessed and assessed the ancient traditions of abstraction that are encoded within proverbs, Adinkra symbols and other narratives to tell her personal and our collective stories. The exhibition ends on Sunday May 29. John this is a fantastic write up and what this lady does is outstanding . i applaud he LOUD . Yet another laudable service from John Owoo. Bringing us all these happenings from around everywhere. I had a quick look at Fatric’s latest show at the Nubuke Foundation a while ago. Wow. 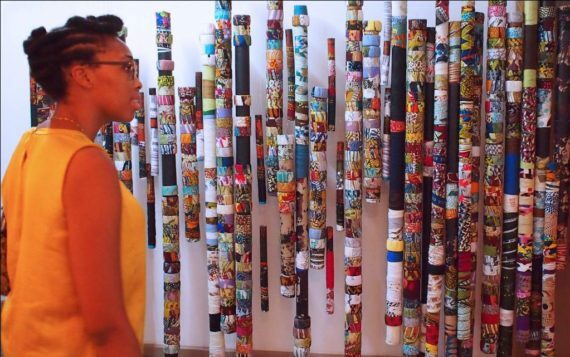 This young woman, yet another alumnus of KNUST School of Art, Kumasi, is going places. She’s got what it takes. She’s still searching for her singular voice. She will get there. John, a quote or two from Fatric would’ve been luminating, to reveal the pulses simmering through her latest menu and the symbolisms she seeks to share with us. 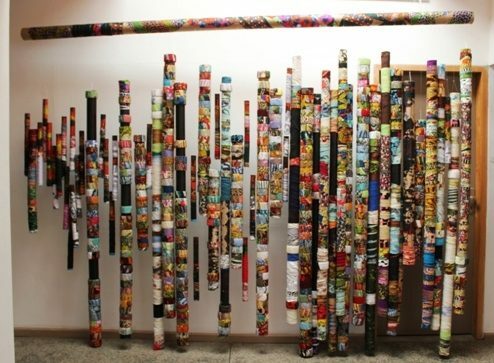 Beyond the politico-social engagements replete in her work, Fatric taps into what she calls the “sounds, colours and smells of nature.” Rain, wind, thunder, lightening are given tactile form and expression. Significantly also is this. Like all true artists, personal sacrifices by Fatric are par for the course. A hefty portion of her earnings by teaching art in college is ploughed into the making of her art. 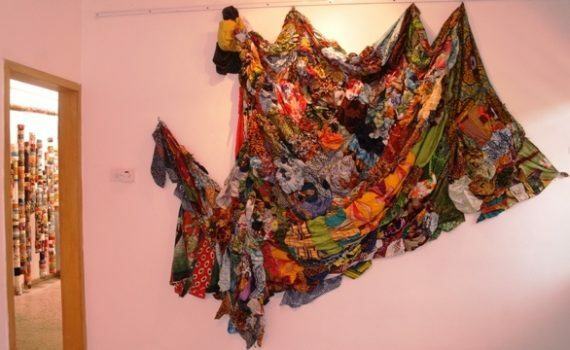 She incorporates a good amount of discarded objects and flotsams collected in markets and on the shores of Accra but her main materials are new fabrics/textiles that don’t come cheap in the shops. Hello, corporations! Some spot of sponsorship will do wonders for this budding virtuoso.